As far as I can ascertain, the X-files is more or less an adaptation of the Fortean times in which every uncanny or weirdly creepy story from the magazine happens to the same people: Dana Scully and Fox Mulder. One rather big difference, though, is that each the X-files episode was seen by around twenty million people while the Fortean times has a circulation of less than twenty thousand.1 Another, admittedly smaller, difference is that I am not aware of chess appearing in the pages of the Fortean times but I very much am aware of chess in the X-files. 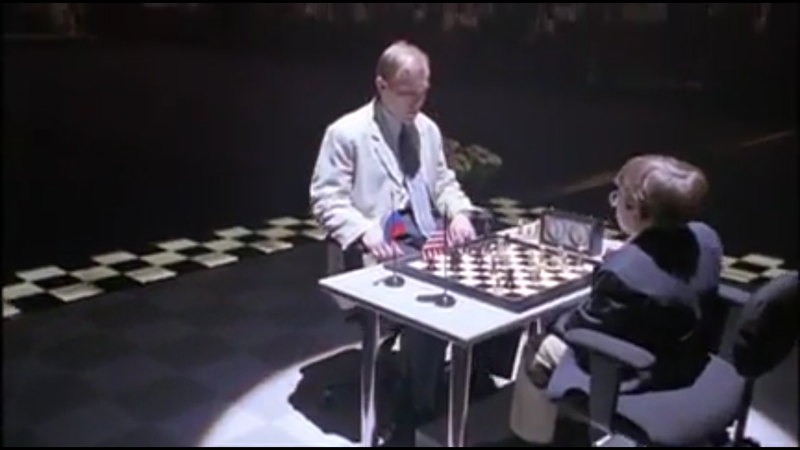 The end, the 20th episode of the fifth season, starts with a game between Gibson Praise, a young American prodigy, and Anatoly Klebanow, a Russian grandmaster. This is the very first scene of the episode and already the supernatural theme is lathered on thickly. The fact that a thirty-something is losing to a kid is fairly commonplace, nowadays, but that this happens in a huge auditorium is very strange and that there are only two players in what is apparently called a tournament is super weird, but what immediately gives an eerie vibe to the situation is black’s tie. Note its unusual length and the way it looms forth from Klebanow’s neck and slithers down his body, over his suit. I cannot claim to be an expert, but don’t people who wear ties usually tuck them away under their suit? And here we have final confirmation of paranormal activity, more precisely on black’s kingside. Indeed, the only logical explanation for the transformation from the jumbotron image to this diagram is that a poltergeist lives under the table and it has brought chaos to the board. How else would black end up with a doubled f-pawn in a few seconds? Another second or two later, we again get a clear view of the board. 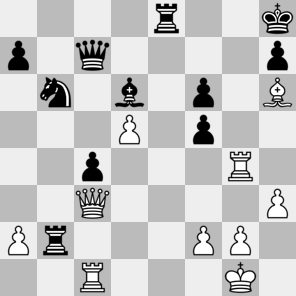 Apparently, black has played Re5, which looks horribly stupid, and white has answered by Rg8+, which is madness,3 except that somehow black’s f6 pawn is back on f7 again! Now, of course, the combination works: there follows Kxg8 Qg3+ Kh8 Qg7#. 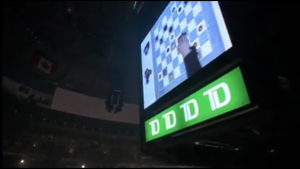 It doesn’t make sense, though, as any halfway decent player – let alone a grandmaster – would spot this trick a mile away. Especially since both players have at least twenty minutes left on their clock. Ten Klebanow gets shot, which makes no sense whatsoever, but that’s outside the scope of this blog. Realism: 0/5 Mulder would probably be convinced, but I’m not. Probable winner: Klebanow is mated and shot. That seems to leave Praise as a winner.